Maoriland Film Festival is Aotearoa’s international Indigenous film festival. Each March, Māoriland brings Indigenous filmmakers from around the world to celebrate their work with screenings, workshops, and other special events. The festival, now in its fifth year welcomed 12,500 people to Ōtaki earlier this year. In celebration of its fifth birthday Māoriland is bringing a selection of films to the North this July with screenings and free two-day filmmaking workshops for rangatahi in Whangarei, Kaitaia and Auckland. Mankiller (2017) is the story of an American legend, Wilma Mankiller, who overcame rampant sexism and personal challenges to emerge as the Cherokee Nation’s first woman Principal Chief in 1985. MANKILLER examines the legacy of the formidable Wilma Mankiller, who has been credited to this day as one of the most important leaders in America’s fight for equality. In March, Mankiller was named Māoriland People’s Choice for Best Documentary. Mele Murals is a documentary on the transformative power of modern graffiti art and ancient Hawaiian culture for a new generation of Native Hawaiians. At the center of this story are the artists Estria Miyashiro (aka Estria) and John Hina (aka Prime), a group of Native Hawaiian charter-school youth and the rural community of Waimea, dealing with the ill effects of environmental changes and encroaching modernisation on their native culture. In 2017, Estria travelled to Aotearoa, creating three murals with rangatahi in Ōtaki. There are plans for Estria to return to work in more locations around the country, this screening is an opportunity to learn more! Through Our Lens is a kaupapa that takes Māori rangatahi filmmakers to the world. In 2017, Māoriland selected 14 rangatahi filmmakers aged 13 – 24 to travel to Samoa, Hawai’i, Rarotonga and Tahiti to work with Indigenous youth in each nation to tell film stories. Over five weeks, Through Our Lens worked with forty-seven youth, to create nine short films. These films tell stories of identity, the effects of colonisation and challenges they face from the perspective of the communities that they were born in. Through Our Lens will repeat in 2018, with applications opening in late July. Rangatahi are invited to attend this screening to watch the 2017 films and learn about how they may become involved in the programme. 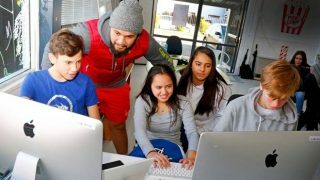 Rangatahi aged 13 – 24 are invited to participate in free filmmaking workshops in which they will be mentored by experienced rangatahi filmmakers to produce a short film in just two days. Participants will learn how to create and sequence a film story, basic film terms, camera and sound skills and how to edit using Adobe Premiere Pro. These workshops are part of the E Tū Whānau Rangatahi Film Challenge – this is an opportunity for young Māori up to the age of 24 to create films that present their perspective as young people in Aotearoa. Films entered to the challenge may be screened at the annual E Tū Whānau Rangatahi Film Awards in March 2019. The top prize for the E Tū Whānau Rangatahi Film Awards includes a $1,000 cash prize, alongside industry opportunities. No experience is required to attend. Only 20 spaces available in each workshop.